Choose from our range of cottages in North Devon that are all dog friendly. Take a Look at our cottages available in Braunton, Rich in history and ideal for exploring the North Devon coastline and perfectly positioned between the best beaches of the golden coast. Our surfing guide is packed with tips and tricks to help you have a great surfing holiday. 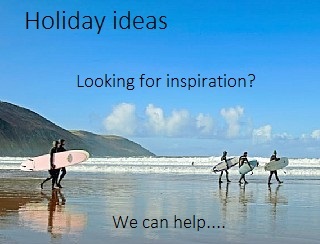 Help with choosing surfing lessons, Surfing conditions, Surfing for beginners, Best beaches to surf and local surf schools. View our full range of holiday cottages that offer short breaks in North Devon. Choosing a day trip from one of North Devon attractions will certainly not disappoint as the region is full of varying contrasts - We have some of the most beautiful rugged coastlines and stretches of beaches in the United Kingdom to the remoteness of Exmoor and the traditional rolling hills of Devon. The inspirational landscapes have influenced famous writers, poets, artists and musicians. Such as Henry Williamson who was inspired to write the famous book "The Tarka and the Otter" in the village of Georgeham! Enjoy the richness of North Devon's heritage with castles, gardens and historic cities to the more lively traditions of today's painting and performing arts. Days out could include uncovering the hidden history of the area with Dartmoor's stone circles and magnificent tors, admire gracious stately homes and formidable castles. Learn about our rich maritime past by visiting the picturesque village of Clovelly with its steep cobbled streets and ancient harbour with a portion of fish and chips! North Devon and Exmoor is simply a unique spot and with the vast majority of the coastline made up of Areas of Outstanding Natural Beauty and National Park land privately owned by the National Trust, whether you prefer sleepy hamlets, traditional market towns or vibrant coastal resorts offering a wide range of amenities North Devon has it all ! - RHS Rosemoor Gardens is 65 acres of beautifully manicured gardens, well presented themed area's and set in a dramatic steep wooded valley. The all year round gardens are an abundance of colour and perfume. Woodland walks, water features and a wonderful place to chill out, relax and absorb the beauty of all RHS Rosemoor gardens has to offer. - A 2 mile route with lots of ups & downs and some amazing views towards the Atlantic and Lundy Island. - Follow the Toll Road through Woody Bay. Not for the faint hearted a very narrow single road which hugs the cliffs and the passenger will be looking down into the sea, a big drop ! Through the trees and woodland, passing small waterfalls you then emerge suddenly into what feels like another 'planet' Valley Of The Rocks is stunning & Breath taking huge rock formations that have stood for thousands of years. Inhabited by a colony of mountain goats. This road leads you into Lynton & Lynmouth which is another perfect day out - Why not combine the two! - Englands Little Switzerland. Lynton was destroyed in Aug 1952 by a flood there is a n amzing museum in the village with a model a=of the village as it was before that fatful night and detailed stories and newspaper clippings of the rescue and re building. Another famous story from this little hamlet is The Overland Launch. A cliff railway connects the two villages of Lynton & Lynmouth. - Three and a half miles long and just one mile wide, this stunning island lies off the North Devon coast. It is the first Marine Conservation Area. The only route to Lundy is via the HMS Oldenburg or helicopter from Hartland Point. Once there you are surrounded by birds, flower & fauna. The peace and tranquillity is indescribable. Lundy Ponies, Seeka Deer, Seals and Puffins all have their home on or around the island. Part of The South West Coast path walk. Broomhill Art Hotel & Gardens - Barnstaple. - A wonderful balance is found between art and nature and the winding paths that will take you to sculptures in woodland gardens. An ever growing gardens full of beautiful sculputures by local artists. - Braunton Museum is a wonderful insight into the early beginnings of the village. Documenting from the 6th century with the arrival of St. Brannock with Mueseum travels through the time of Braunton Railway, Henry Williamson, Maritime & Wartime History, The Great Fields & Agricultural history. Housing interesting displays of domestic and family histories of the inhabitants of Braunton. - Hartland Abbey lies across a narrow, sheltered valley which winds its way to the spectacular Atlantic Coast. it contains collections of pictures, furniture and porcelain which have been collected over various generations. The abbey holds a lot of fasinating history and is one of the United Kingdoms national historic house. - Mortehoe a delightful village perched along the coast from Woolacombe. Renowned for smugglers and ship wreaks it has a pretty church, cream tea rooms, craft shop, fresh fish shop and a Deadly Coast Walk.